We appreciate your support throughout the season and look forward to continuing to deliver you delicious cakes in 2019! Don’t forget that Caluda’s King Cake offers king cakes year-round! Specialty king cakes are available for order via phone and online. Order for Your Next Occasion! We hand-braid our rich, moist Danish dough and brush it with melted butter and cinnamon sugar. Each Caluda’s Mardi Gras King Cake is finished with our very own vanilla icing and sprinkled with handmade Mardi Gras-colored sugars. Bring one of our Mardi Gras King Cakes to your next office event, church function, family gathering, or other occasion. Order a piece of New Orleans today! 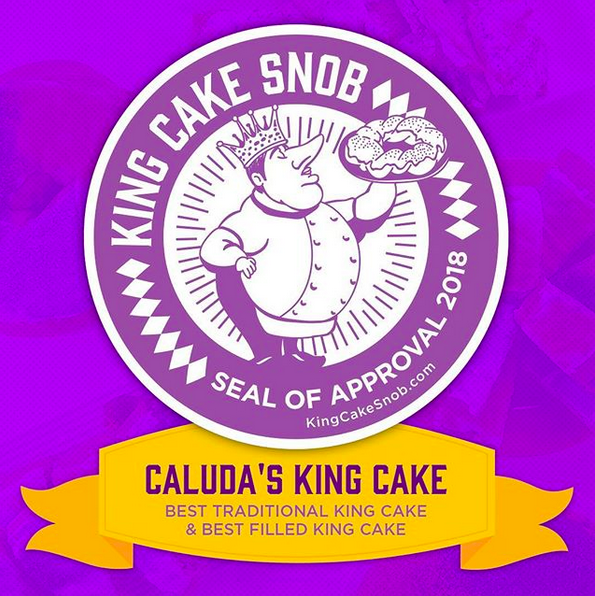 Caluda’s King Cake proudly serves the New Orleans metro area. We operate out of a 10,000 sq. ft. bakery, creating a wide variety of delicious king cakes for locals and visitors alike. Choose from traditional Mardi Gras King Cake favorites like cinnamon, strawberry, or cream cheese, or try one of our non-traditional cakes like the Caramel Kringle Cake or Praline King Cake. Pop in and get your fix. We offer weekly specials during Mardi Gras season featuring specialty flavors like Maple Bacon Praline and Bananas Foster. Located in Harahan, LA, Caluda’s has been shipping to king cake lovers all over the country since 2009. All of our cakes are made to order. Learn more about our shipping services so you can enjoy this Louisiana treat year-round. Order yours online or stop by for pick up today!